Home brewer Jason Takes a Gold! Congratulations to Jason Bryant who won a Gold Medal in Category 23, Specialty Beers, at the National Homebrew Conference. 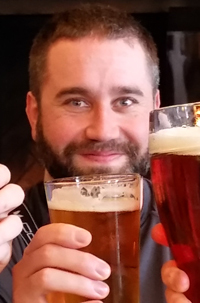 Jason’s Session IPA ranked first in the category out of a total of 410 entries! Many of our Old Ox followers will recognize him from his Raptor IPA … an American style IPA that was served in our tasting room during American Craft Beer Week. Way to go Jason! Nic work Jason! Hey mate, you can come down and visit us in Oz any old time! I suspect your homebrew skills have left me in the dust now. I struggle to get the right stuff for brewing these days now that we’re living on the edge of the earth over here. Could use a few pointers to get up to scratch! Keep up the great work and send us some recipies!